When you spend 25 years trying to find that Grail kit, you come to a point where you are willing to settle for less just to find something close you can work with. 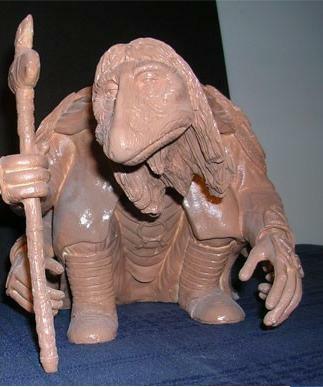 When I found a Dark Crystal urRu Mystic at WonderFest 2009, it was a relief just to know that someone out there did, in fact, make one. And that is about all one could say. The movie featured ten different Mystic characters, yet this kit is probably an amalgam of all ten, while not doing justice to any of them. The kit's high point is the head (you get two--one with hair and one without). The accuracy to one of the Mystics is rather astonishing. The option to use the molded-in hair version or try to painstakingly place the provided crepe hair is a nice touch, but if you are going to use the 'real' hair version, you had better consult a stage make-up book figure the best way to pull it off. The kit comes with no instructions and no paint guide other than a built-up photo on the box. The rest of the urRu is an exercise in rebuilding. The back 'horse blanket' is not accurate to any of the Mystics, the tail is wrong and too short, and the four arms do not have the gauntlets (but the four fingered hands are molded quite well). Even the walking stick bears no resemblance to any of the originals. 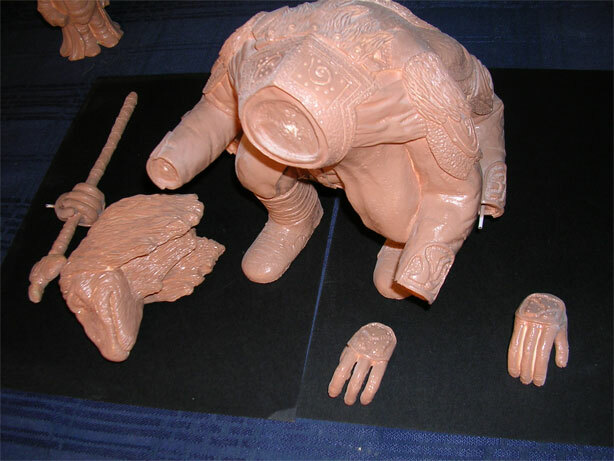 However, with judicious use of your Dremel, you should be able to grind off most of this detail and use your own talents to putty up a far more accurate version of the gentle creature from the fantasy classic. Black Star Models is not producing these kits any longer and the website that was listed on the enclosed business card is no longer active. Still, you might get lucky and run across one of these kits at a trade show like I did.